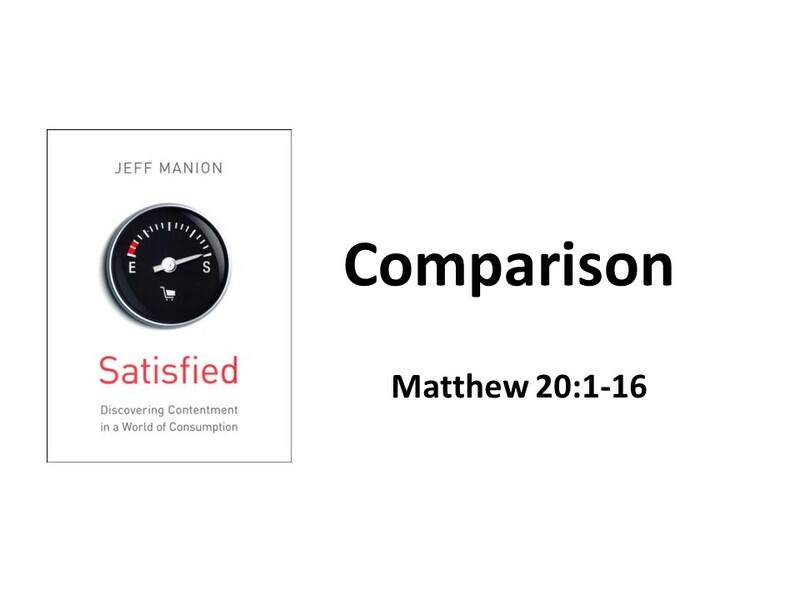 This is our second week of looking at topics found in the book Satisfied: Discovering Contentment in a World of Consumption. Last week we talked about enrolling in the School of Contentment. I mentioned in that sermon the problems with comparing ourselves to others. We’re going to dive deeper into the topic today as we explore the Parable of the Workers in the Vineyard in the 20th Chapter of Matthew. This parable could be approached on many levels. We could explore God’s will for work. God created us to labor. Despite the bumper stickers that say, “A bad day of fishing” (or golfing or any other activity) is better than a good day at work, we’re made to be productive. What work for you or me looks like may be different? Some of us may work at home, raising kids and keeping house, others of us work in factories, on farms, in construction, in offices or on the road as sales personnel. Where we work and how we’re paid is immaterial to the fact that we’re created to spend six days a week involved in some kind of productive activity. God doesn’t create couch potatoes! But the parable also teaches us something else in addition to our purpose on earth, which will be my main focus this morning. If we want to be miserable, compare ourselves to others and the opportunities that they have. “Comparison is the thief of joy,” Theodore Roosevelt supposedly said. There will always be someone with more stuff or better looks or a better looking spouse or whatever. There will also be someone who appears to be a better disciple than us. Likewise, there will also be those with less stuff or whose looks have faded. And of course, unless you’re a Hitler or Pol Pot, it’s easy to find someone who is more evil. If we want to be satisfied with life, forget about comparing ourselves to others and accept what we’ve been given by God as a blessing. Read Matthew 20:1-16. The last shall be first and the first last… Sometimes we will be surprised. Thing about it: a Chicago Cubs/Cleveland Indians World Series! Two teams that know what it means to be at the last. Let’s hope it goes to seven games! This parable hits hard. We believe we should be rewarded for our efforts. It’s instilled in us from an early age that if we do good and work hard, we’ll be rewarded. Such beliefs drives our incentive to work, at least economically. You know, this belief of reward for hard work is a myth. Things don’t always work out that way. Those who come from wealthy households tend to continue to be wealthy and those who live in poverty tend to continue in poverty. Sometimes circumstances intervene: an illness, an accident, a stroke of luck, the winning of a lottery. The myth of hard work paying off was laid bare in the mining camps of the American West. Some folks dug and dug and broke their backs, barely making a living. Others just happened to strike the pick on the right ledge and become incredibly rich. And then some others discovered that hard work with a pick and shovel wasn’t for them. They came to understand that it didn’t matter how much they ore they could bring to the surface, what mattered was how much ore their investors thought they could bring up. Some of these guys became incredibly rich. A few ended up in jail. But still, most of us think a worker deserves his or her wages. Scripture confirms this. The harder we work, the more we should be rewarded. Because of that, this story runs against how we think things should be. 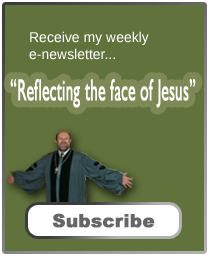 As Americans, most of us can’t imagine the scenario that Jesus creates in this parable. You’ve got a group of workers, laborers, waiting around in the market place. They have no resources; they are totally dependent on those who own the fields and who, during the harvest, need a few extra hands. It’s a scene common in third world countries, where the men gather in the village square before dawn, waiting around for farm supervisors to hire them. The laborers stand up straight and try to look strong, hoping they’ll be chosen to work and thereby have the money to feed their families… If chosen, they jump into the back of a truck for the ride to the field. After the selections are made, those remaining shuffle around, waiting for the next opportunity. It’s the height of harvest… The fruit ripens quickly and needs to be picked before it starts to rot on the vines. So the landowner comes again and again into the town square, each time picking up new workers. By five o’clock, only an hour or two before dark, everyone is hired. As the hot sun drops toward the horizon and the air cools, the light becomes softer and the shadows lengthen, it’s time to pay off the workers. They lined up. You’d think the landowner would pay off those who have been in the fields the longest, allowing them to head home for a shower and to buy food for their families. But this is a story designed to tell a greater truth, so Jesus reverses it. The landlord pays the short-timers first. The foreman hands out the pay envelops and those whose hands are barely dirty look in and are surprised to see that they have earned a denarius, the equivalent of a day’s labor. Seeing this, the men whose skin is red from having worked in the sun, whose clothes are stained from the fruit, think they’re going to make out exceptionally well. “He’s paying the short-timers a day’s wage, certainly we’ll receive more,” or so they think. But that’s not what happens. They grumble and complain. They don’t think it’s fair, and let’s be honest, neither would we. But the landowner, the one who had hired them, addresses them as “friends,” and remind them that they received the wages for which they’d agreed to work. By paying those hired on at the end a day’s wages, this gracious landowner ensures that all families will have bread for dinner at night and more. If they’d only been paid for an hour’s work in a society where food is expensive, they and their families would have go to bed hungry. Of course, this is a parable essentially about the kingdom and how God is free to bestow grace on whom he chooses. Our parable is bookended with that little saying Jesus often repeats, “The last will be first and the first last.” It comes at the end of the 19th Chapter and again at the end of this parable. The parable demonstrates the truth of this proverb, reminding us that Judgment Day will be a day of surprises. When it comes to comparison, we look to those at the head of the line and are jealous. But Jesus reminds us that God’s economic system doesn’t work like ours. Secondly, the parable is also Jesus’ way of responding again to Peter’s question back in 19:27 (“Lord, we’ve left all for you, what will we get?”). Although Jesus promises the disciples rewards at the end of the 19th chapter, he now emphasizes that they must not think of their sacrifices as so great that they look down on others who are also a part of the kingdom, but have not made the same kind of sacrifices. Likewise, it’s a warning to Jewish Christians who, as we know from early church history, looked down upon our ancestors, Christians who had been gentiles. Furthermore, it is a warning for us not to look down on others who have not or cannot make the same sacrifices as we have. Within God’s economy, we’re to do the work which we’ve been called, and should do it without grumbling. As Paul tells the Philippians, we’ve been granted the privilege not only of believing in Jesus but also suffering with him. Finally and most importantly, “the parable teaches us the amazing grace of a Lord who lifts the last into a place of honor. Those seemingly less effective, the less fruitful little people, the spiritual latecomers are all rewarded. These workers are honored not because they have done enough good works, but because they have a good Lord. We depend on God’s graciousness, not on our work, so whether we labor all day or receive our honor at the end like the thief on the cross, we’re to be thankful for we couldn’t do it on our own! You know, what others are doing isn’t really our business. God calls us and instead of worrying about our pay, we need to be concerned with whether or not we are doing the master’s work. If we’re only after a free pass into heaven or to get what we can for ourselves, we’re not really disciples and we’re coming to religion for the wrong reasons… We should ask ourselves, “Why would God even give me a chance?” Remember, we could be left in the marketplace, kicking cans and going home at the end of the day with empty pockets. So instead of looking at envy with those who worked fewer hours, we should give thanks that we are given an opportunity to be a part of God’s work in the world. Think about the times when we have been the one hired on at the 11th hour, those times when we got undeserved breaks. I remember one night; I was driving home on Highway 87 through Elizabethtown, a small city in eastern North Carolina. Like a lot of small towns, they extend out their speed zones, so long after you’ve left the part of town that has street lights and are back on a dark highway, the speed remained 35 miles per hour. And I knew that! I’d driven this road many times before. And I also knew where they police hung out. But for some reason, this night, I wasn’t thinking or paying attention. I began accelerating back to highway speeds of 55. Then blue lights appeared. I knew I was guilty and admitted it. And then, for reasons beyond me, the officer gave me a warning ticket! It was like being hired on at the 11th hour; I was shown more grace than was necessary. The landowner demands the right to pay on the basis of his compassion, not on the merits of his workers. When we consider that this is a parable about the kingdom and what God has done for us, I think we’ll be glad that God deals with us with compassion and not merit. If we’d spent the day in the field, we’d feel we were mistreated. But do we really want to live in a world where we are given our due? Where justice is dispensed without any consideration of mercy? In such a world, we’d all be up the creek, for as Paul says, “All have sinned,” and “the wages of sin is death.” But he goes on to say, the gift of God is eternal life in Jesus Christ our Lord. In Paul’s way of thinking, we’re all called to work at the 11th hour and we can give thanks to God for the opportunity. All good gifts come from God. Accept the gifts you’ve been given with grace and be thankful! Don’t spent time comparing yourself to others for you will find that either your own balloon of blessings will pop, leaving you with an empty feeling. Or, you may assume falsely that just because you have more, you are better. They’re problems with both outcomes! Don’t compare, be grateful! Amen. F. Dale Bruner, The Christbook: Matthew 13-28 (Grand Rapids: Eerdmans, 2004). Douglas R. A. Hare, Matthew: Interpretations, A Commentary for Teaching and Preaching (Louisville, JKP, 1993), 228. Bruner, 317-318. Bruner has four summaries from the passage, but I combined his second and fourth together to create three. Great sermon on Matt 20:1-16. Right to the point and made the Scripture message so clear. John asked me to say he found it very enlightening too. He said his Tuesday Bible Study had some questions on that passage and now he feels he can explain it very clearly. So clear that it is not the works but God’s grace that saves us. I’ll take mercy over justice anytime.